Cue applause, standing ovation, follow spots, glitter cannons and Tina Turner singing Simply the Best. “Wow! Oh My God! I cannot believe it, thank you, thank you. This is the happiest moment of my life. There are so many people I would to thank, all the little people that helped to make this possible. I would like to thank God, my parents and Centro, without them I would not be standing here tonight. It would be impossible to thank everyone, but there are are those that deserve a special mention. To the driver of the 529 bus from Walsall to Wolverhampton who couldn’t add up the correct fare for me and my travelling companions, thank you. For slamming on the brakes for no apparent reason as we left the bus station, thank you. The bruise on the small boy’s head is now receding. To the two teenage girl passengers loudly arguing over the affections of some slack-jawed youth, thank you. The swearing was magnificent. To the young man smoking dope at the back of the bus, thank you. Respect again for the driver. For waiting for two minutes at every bus stop and driving like a maniac between stops, thank you. For parking outside Wolverhampton bus station and refusing to let us off even though we told you that we had a train to catch, thank you. For entering the bus station at two miles an hour when the speed limit is ten, thank you. For explaining the regulations to us before finally opening the door of the bus, thank you. To the smokers congregated outside Wolverhampton railway station who, seeing us running down the ramp to catch the train, refused to get out of the way, thank you. To the passengers on the platform waiting for a later train, blocking access with your heavy luggage to the train about to depart is nothing short of genius. To the fellow travellers occupying our reserved seats, booked weeks in advance, “f**k off, sit somewhere else” is not the correct response. To the young man playing car alarm hip hop on his phone, thank you for the audio toothache. To the fat man in a vest who sprayed me with Special Brew as he opened one of his cans at ten in the morning, thank you. To the beautifully dressed middle-aged lady who decided to leave her suitcase on the table rather than in the luggage rack and so left us unable to play travel chess, travel backgammon and travel connect four, thank you. To the train guard who failed to grasp the meaning of a family rail card, thank you. To the operative dragging the refreshment trolley, £1-80 for a cup of tea and £1 for a packet of crisps, no thank you very much. The return journey featured a broken toilet full of vomit, four old people eating fish and chips and about eight young people throwing bits of pizza at each other. Thank you, one and all. Back at Wolverhampton bus station, special thanks must go to a different driver of the 529 bus who, seeing us rush to the stand with our luggage, closed the door as the small, bruised boy attempted to board. To the driver, for his cheery smile as he drove away, thank you. Thanks as well to whoever decided that it should cost 20p for a small boy to go to the toilet. No wonder your lovely new bus station stinks of wee. Okay, I know, I know I’m running far too long, but there are some more people that need thanking. To the architects of the Walsall and Wolverhampton bus stations, thank you. Keep trying to walk upright, you may achieve something. To the decision makers that approved the designs, thank you. You can find the number for the Samaritans in the phone book. To whoever decided to cut the direct rail link between Walsall and Wolverhampton, I wish you a slow and lingering death and whoever decided to privatise public transport, well, you are the true stars tonight. My achievement is absolutely nothing compared to your hard work, talent and ability in turning something that was reasonably adequate into something that is dreadful. Thank you. And finally, to my fellow nominees. I am not worthy to be up here tonight. This award is dedicated to those who have to use public transport to get to work, to hospitals, to schools and then get back again. Thank you. Cue applause, laser beams, a hug from Martin Scorsese and a kiss from Rene Zellweger. Cervantes knew a thing or two about farce, delusion and deception, but even in his most ingenious inventions, good old Miguel could not have imagined the man of La Mancha crossing the Rushall Canal at Riddian Bridge and riding towards Aldridge to save the good citizens from big, scary giants. Controversy is nothing new when it comes to the installation of wind turbines. In the north of wild and woolly Scotland, the patrons of a grouse moor howled in indignant outrage at a proposal to harness the power of the wind to bring electricity to the humble crofts of the local peasantry. Astonishingly, the Barboured landed gentry argued that the turbines would kill birds and would therefore be inhumane. The second objection was the thinly veiled threat of the “accidental” unloading of Purdey 12 bores into masts, fans and any passing maintenance engineer. The real objection, of course, was that the shooters wanted to preserve their right to blast God’s creatures out of the sky for fun without the competition of machines supplying the national grid. The banks of the Rushall Canal are not usually frequented by the inbred heirs of lords and ladies toting shotguns, but the hackles of the locals have risen at the thought of an inhumane turbine being placed in the same borough as their back yards, spacious back gardens, car ports and conservatories. A petition against the blot on the landscape has been signed and presented, posters of objection have been placed between the chintz and the double glazing and, once again, the ridiculous idea of free, sustainable energy has been exposed as a bird killer. Add to this horror the nuisance of the noise from swishing blades that will create “an almighty din” beyond shotgun range from the nearest house and the fact that the turbine will spoil the view of the architectural magnificence of the Redhouse Industrial Estate and you will realise that the residents have a just and honourable cause. Given the vehemence and decibel level of the opposition presented by the nice people of Rushall, Aldridge and the eastern wastelands of St Matthews, it is blindingly obvious that the single turbine will now not propel itself through the planning process. Safe in the knowledge that the giant will not be erected, Walsall’s own Don Quixote, in the formidable shape of Councillor Mohammed Arif, now offers his lance to topple the imaginary behemoth. No longer a member of Walsall’s Planning Committee, Don Arif still knows a thing or two about the planning process and must be fairly confident that the twirly thing ain’t gonna happen, hence his very public and slightly delayed objection to the scheme. After his St Matthews Conservative ward colleague Barbara McCracken legged it over the border to Paddock to ensure her cabinet seat, the good Don must be worried about securing his own cabinet allowance. His implacable silence when confronted by the concerns of constituents in the poorer parts of his domain is in marked contrast to his shrill condemnations when the better off kick up a fuss. This sudden interest in ornithology and all things green and pleasant will, no doubt, please the Royal Society for the Protection of Birds and Friends of the Earth who both support the idea of a sustainable source of power at College Farm. It is difficult to gauge who is the more deluded but given the horticultural activities that went on in the empty carpet warehouse he co-owns, Don Arif seems to be under the influence of the laughing lettuce. For some, the grass is always greener in a safe Tory seat. Councillor Arif, irrespective of cannabis cultivation, knows a thing or two about farms and he and his fellow ward councillors will “continue to work with residents to stop plans to cover Walsall with wind farms by organising public opposition”. Whatever next? Will the desperate councillor chain himself to a cow demanding that electricity pylons be removed and the new fangled canal be filled in to protect our heritage? I think not. Arif, clearly under pressure, is sniffing out votes for next May and his job in cabinet involving counting the paper clips and over ordering office furniture at the civic centre is ripe for outsourcing. The ridiculous Eric Pickles might want to destroy local authority planning procedures but with men like Arif in place, happy to see the ruin of Mellish Road Church for example, the political contradictions are a delight to behold. Sadly, Don Arif has no Sacho Panza to accompany him on his quixotic quest. If he had, no doubt his companion would say that the arms of the giant are whirled around by the wind to power the plasma TVs, microwaves, phone chargers, Nintendos and intruder alarms of Bosty Lane and the Mellish Road. Perhaps Don Arif would like to see an increase in expensive, imported Polish and Russian coal to keep our home central heating burning? Perhaps he would like to see working men in the claustrophobic hell of twelve inch seams in Welsh drift mines? 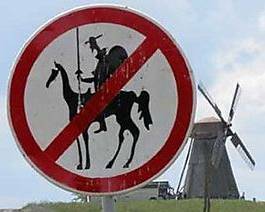 Quixote started and ended mad. As for Arif, only your vote counts. A week ago, in a howling squall and engulfed in what looked suspiciously like sleet, the youngest hippo entered the gates of secondary academia at precisely 8-03 on a dark Tuesday morning that seemed to belong to February rather than early September. About 48 hours earlier and about 2,000 miles to the south east, he took a final swim before breakfast in temperatures already approaching 30 degrees C. Setting off for the airport and the flight home, he said he was looking forward to Year 7. Given the dark omen of a dark morning and the embarrassment of a tearful father with a blown inside out umbrella, he seemed remarkably cheerful for a little fish entering the big pond of Key Stage 3. After failing and currently in the process of failing his elder siblings, the UK education system and particularly the authorities in Walsall, have one last chance to provide him with what is his basic right to a decent, thorough and inspiring education. Sadly, this is unlikely to happen. The squall of last Tuesday morning was nothing compared to the perfect storm that now conspires to wreck his and so many other futures. With Cameron telling the Daily Telegraph that we need “elitism” in schools, with Dave Willets telling Radio 4 that “voluntary work makes people happy” and Michael Gove suggesting that the children of “bad” parents should be taken from their families and put up for adoption, the pretence of deficit reduction has finally been abandoned in favour of the blatant dogma of privilege. These millionaires may describe these ideas as “radical” and “necessary”, but they are hardly new. A charming chap by the name of Heinrich Himmler had very similar ideas a number of years ago. Add to this the “changing landscape” of education in Walsall. The utter shambles of previous local authority control replaced by the naked greed of a private company that would render down their own grandmothers for glue if it was profitable, makes the word “betrayal” sound like a compliment. Mercifully, the days of Serco are finally numbered and a lot of the mercenary bullies have taken the golden parachute into secure pension heaven. However, a lot of the good guys at the chalk face have been sacrificed for the sake of the balance sheet and the next two years will see the “changing landscape” become scorched earth. Having been duped into signing away the aspirations of Walsall children on the basis of fictitious and broken promises, it remains unclear how much the giant intellects in cabinet will have to cough up to kick Serco out of town. Returning control of education to the incompetents that inhabit cabinet is, of course, unthinkable. Serco ruled by intimidation and fear and having failed to make any progress in educational standards have been shown the door in Stoke, Bradford and now Walsall. Free from the irritation and inconvenience of having to produce results, Serco can now return to their comfort zone and concentrate on detaining and mistreating children in Immigration Detention Centres. There is, after all, more profit in abuse. The local authority, in the shape of the fat owls roosting around the cabinet table, does not possess the ability to oversee a tuck shop let alone education. In normal circumstances, Bunter and his chums in the remove would be terrified of having their obvious failings being exposed by Mr Quelch. Circumstances are, however, far from normal. The last thing secretary of state Quelch, better known as Michael Gove, wants is to have local authorities running schools. It simply will not do to allow locally elected representatives to keep their pudgy little fingers on the cakes, pies and jammy dodgers fund. In the case of Walsall, this is probably a very good thing but for other more capable authorities, it means the end of local accountability. Gove`s master plan to privatise and therefore devalue state education has proved to be a Godsend for our useless burghers. Firstly, it gives them the excuse to terminate the ridiculous contract with Serco and so bury their gullibility under the smoke screen of the “changing landscape”. Then, they can throw up their jam covered hands and explain to parents that forcing schools into academy status and out of local control is coalition government policy. You must surely remember the coalition government – you know – the politicians that did not win the election and tore up their manifesto promises. 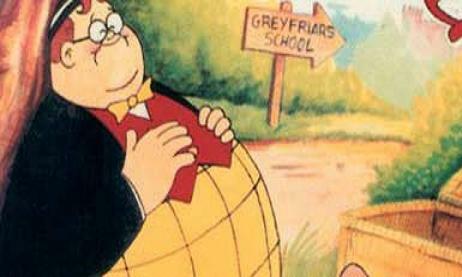 Furthermore, the fat owls in the council house need not fear a thrashing from Quelch as he is on their side. Academies operate without the interference of scrutiny, councillors, openness or those pesky parents. A week into the autumn term and a shift in attitude from Serco has already become evident. The whip cracking threats have been replaced with offers of support to schools with the gently smiling jaws of crooked estate agents or no win no fee ambulance chasing lawyers in an attempt to wring the last penny out of Walsall. Serco will provide nothing unless the school pays for “traded services” that have already been paid for. Senior managers from both Serco and the council are inviting themselves to governors meetings to pitch for business in the style of shysters trying to sell a time-share on the Algarve and to promote the benefits of academy status. The benefit being that if you don’t become an academy, you won’t get any funding and there will be no point in expecting the delivery of a postal order. Oh crikey. As the desperation to make money intensifies, it won’t be long before headteachers arriving for work will be confronted at the school gates by senior Serco managers armed with buckets and mops who, after giving the windscreen a cursory wipe, will demand money with menaces. After a hard day educating children, the same headteachers will receive phone calls telling them that Serco just happen to be in the area and that their school has been randomly selected to be eligible for discounted double glazing, loft insulation, computer upgrades and maybe a few free books. Just send your bank account details to a post office box in Nigeria and don’t forget to tell your friends. After a week, the little hippo has become a big hippo. He can take the bus to school unaided, he has met new friends and has even accrued an alarming amount of credits for his work. Given his expertise and his experience of transition between primary and secondary, he would do a better job of running education than the idiots in charge at the moment. Rather than enjoying the cusp between childhood and adolescence, he has to battle against the vindictive oppression of the likes of Michael Gove and a completely hopeless council. With luck, he and his peers will survive the ruin of education. Without luck, he and his generation are doomed to failure through no fault of their own. Thank you very much Michael Gove.